View More In Game & Trail Cameras. Enjoy performance at its peak with a 20-megapixel sensor that produces stunning images day or night, viewable in the field on a built-in 2-inch color screen. 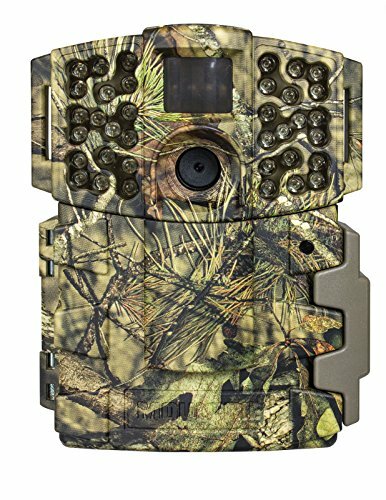 Moultrie’s iNVISIBLE infrared flash technology with a 70-foot range, a trigger speed under half a second, a quiet design and adjustable infrared sensitivity allow you to covertly capture quality nighttime images and full HD video with sound, while an easy-to-use Quick Start menu makes setup a breeze. You’ll also enjoy extended battery life, a long-lasting infrared filter and better-than-ever image storage capacity. iNVISIBLE INFRARED FLASH: A flash equipped with 36 iNVISIBLE infrared LEDs illuminates game up to 70 feet away in total darkness, without giving away the camera’s position. PHOTO & VIDEO RESOLUTION: Manage image quality and storage with 4 resolution settings, from low (1280x720px) to enhanced (4224x2376px), and capture full HD video in 16:9 aspect ratio. SPECIAL FEATURES: Multi-shot, time-lapse and hybrid modes (triggered by passive infrared and time lapse) offer hunters total versatility and customizability while reduced motion blur and extended flash range enhance nighttime image clarity. EXTERIOR: A sturdy case with a weatherproof plastic exterior comes with standard 1/4"-20 bottom tripod mounts and back slots for use with an included nylon strap or Python lock cable (sold separately) for tree mounting. A Python lock-compatible clasp offers added security. MEMORY CARD COMPATIBILITY: Works with SD/SDHC Class 4 cards or higher and can handle up to 32 GB. Memory cards sold separately. MANAGED MEMORY: If set to “Overwrite Oldest,” the M-999i will erase your oldest photos and videos to free up space for new photos and videos when your memory card reaches full capacity. BATTERY LIFE: Requires 8 AA batteries. Captures approximately 15,000 images. Actual results may vary. OTHER POWER SOURCES: Compatible with any Moultrie 12V DC external power source. Camera also supports AC power mode. If you have any questions about this product by Moultrie, contact us by completing and submitting the form below. If you are looking for a specif part number, please include it with your message.